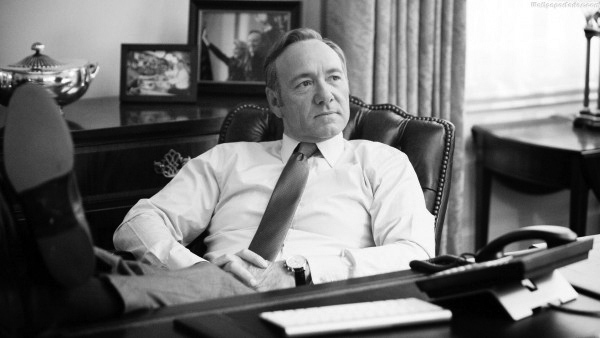 Spacey, delivers a fantastic performance, revealing the dirty side of politics. Seasons one and two of the show focused on Underwood’s desire and path to become the President of the United States, but season three focuses on his time in office, and his campaign to be reelected after his first term is completed. This season focuses on many real world issues including rising tensions between the United States and Russia, conflicts in the Middle East, and hurricanes on the eastern seaboard. The third season puts a large focus on the marriage relationship between Frank and Claire Underwood (Robin Wright). The relationship between them has been more of a subplot in previous seasons, but this season their relationship becomes one of the main storylines. Spacey does a fantastic job playing the president, but one of the most defining and reoccurring moments is when he breaks the fourth wall, looking directly at the camera and addressing the viewer while other people in the scene can’t hear what he is saying. This is something that is often done in theatre, where Spacey started his career, but transitions well into television. Season three also focuses on Doug Stamper (Michael Kelly) Underwood’s Chief of Staff. Stamper has been Underwood’s go-to man when something difficult needs to be done, but this season Underwood distances himself from Stamper after his failure at the end of season two. Stamper is working on his recovery from a traumatic brain and spinal injury, but also working on the campaign of one of Underwood’s opponents. Like the previous two seasons, season three ends with a shocking twist that makes fans want the next season immediately. It’s assumed that season four could be the final season, especially if the show follows suit of 13 episodes per season. With a fourth season of 13 episodes, the series would end with 52 episodes, as many episodes as a deck of cards.